A new elective in Robotics is among the chief highlights to a series of curriculum changes on hand for the 2017-2018 school year. The new course, which will be taught by Mr. Norm Myatt, has already proven a popular option for our students. "Robotics will become the epicenter of SJR's STEAM initiative, said Principal Michael Bruno '05. 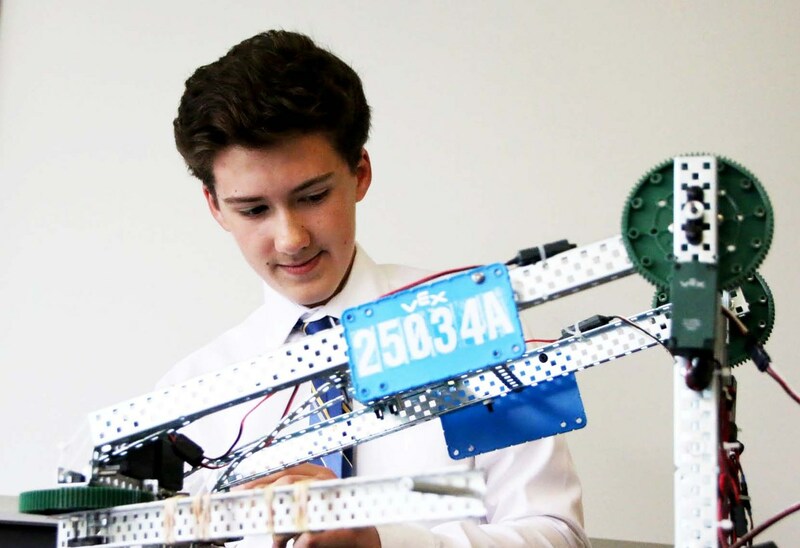 "What started as an after-school club has transformed into a lab-based course that uses a hands-on approach to introduce the basic concepts of engineering and engineering problem solving, focusing on the construction and programing of mobile robots." Mr. Myatt, who has taught chemistry at SJR since 2011, moderated the fledgling Robotics Club last year. The group qualified for the Vex Robotics NJ State Championships on the strength of its success in regional competition. "I am very excited to be teaching Robotics. The new course provides students with a practical introduction to engineering mechanics, robot programming and project engineering in an environment that the students will enjoy," said Mr. Myatt. Course information will be tied to lab experiments; students will work in groups to build and test increasingly more complex mobile robots, culminating in an end-of-semester robot contest. As part of the STEAM program at SJR, Robotics joins Engineering as an option for upperclassmen looking to pursue the sciences in their future. Other new electives added to the curriculum this fall include American History through Music, taught by Mr. Nick DeVito '97, and Sports & Literature, taught by Mr. Joseph Purcella.